You like this blog theme? Continue with the Purchase button and then continue to Step 2. Launch a blog or a portfolio that fascinates with its unique look, recognizable style and a fulfilling user experience with the theme ‘MobileFirst’ of WordPress. It is well equipped with a rich diversity of features and options, like the possibility to choose between a plain color, a pattern or a full screen image for the backgrounds. The theme has fully customizable Archives page and simple navigation for the most effective browsing experience for your visitors. The theme provides the options for uploading of fully Scalable Embedded Video and scalable features images which makes it a perfect choice for a brilliant portfolio for photographs. You can use over 500 Google fonts to enrich the appearance of the theme. 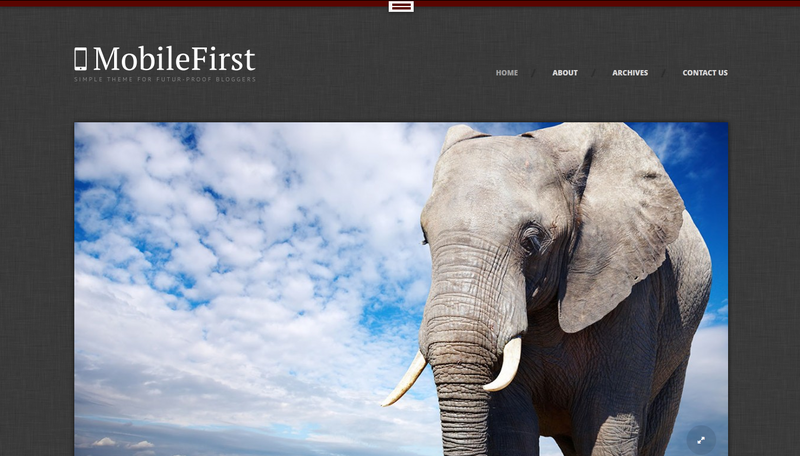 ‘MobileFirst’ is a social friendly theme with the possibility of including of more than 20 icons of social networks. The theme is designed with a responsive layout to be outstanding and beautiful on all screen sizes, shapes or resolutions provided to the mobile devices, laptops or tablets.